Home prices continued their rise across the country over the last 12 months, with yet another increase in September, according to recently released S&P/Case-Shiller Home Price Indices. Covering all nine U.S. census divisions, the S&P/Case-Shiller U.S. National Home Price Index recorded a slightly higher year-over-year gain with a 4.9 percent annual increase in September 2015 versus a 4.6 percent increase in August 2015. The 10-City Composite increased 5.0 percent in the year to September compared to 4.7 percent previously. The 20-City Composite’s year-over-year gain was 5.5 percent versus 5.1 percent in the year to September. After adjusting for the CPI core rate of inflation, the S&P/Case Shiller National Hoe Price Index rose 3 percent from September 2014 to September 2015. “Home prices and housing continue to show strength with home prices rising at more than double the rate of inflation,” says David M. Blitzer, Managing Director and Chairman of the Index Committee at S&P Dow Jones Indices. Comment: This is an excellent article. Long term mortgages are usually priced based on the yield of 10-year treasury notes. Even though the financial markets have been expecting an increase in short term rates from the Federal Reserve for awhile now, longer-term rates like the benchmark 10-year treasury notes have been falling. Most people don’t even think what I’m talking about is possible… They think that when rates go up, ALL rates go up. How could long-term interest rates possibly go DOWN if the Federal Reserve is close to RAISING short-term rates? There’s a 68% chance of a rate hike by the Federal Reserve at its meeting on December 15-16. (That percentage comes from Bloomberg.) Those are the strongest odds of a near-term rate hike in a while. Over the past 25 years, the Fed has entered three rate-hiking cycles. You might expect that long-term interest rates (as measured by 10-year U.S. Treasury bonds) would rise dramatically when the Fed hiked short-term rates. That’s what most people believe happened… But it’s not actually what happened. 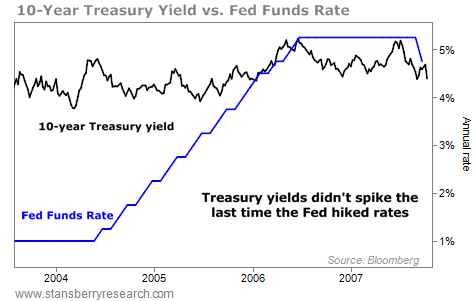 So, do long-term rates have to rise when the Federal Reserve increases short-term rates? Yes, the Fed will hike short-term rates at some point – likely in December – but history shows a Fed rate hike is nothing to worry about when it comes to long-term interest rates. Don’t let your mortgage broker or banker threaten that your 30-year mortgage rates are about to go up. History tells a different story.